Interested in a striking new display idea? Then let modern LED technology come to the rescue! Obtain some Nichia full-color LEDs, (Light Emitting Diodes) model NSTM515S; get help hooking them up if necessary. Although they aren't hard to hook up, it's easy to ruin them if you mess it up. Put a 50K pot (volume control) on each of the LEDs color leads, add a 100 ohm resistor to the red lead, add a 50 ohm resistor to the green and blue leads (one resistor for each lead, not one resistor for them both together), and run the whole mess from about 4.0 to 4.5 volts DC, such as from a "wall wart" AC adapter. You will now have a very bright LED that you can "tune" to virtually ANY COLOR you want!! 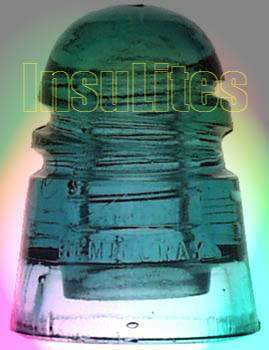 Adjust them to match your insulator colors and use them for some very striking & vivid (and unusually color-correct) insulator underlights! Bubbles, swirls and snot inside your insulators really show up nicely. Follow the little black wires... there be InsuLites in them there insulators. To use these LEDs: Place them underneath your insulators (pointing straight up), dim the room lights, and enjoy your collection! Decide to move or replace insulators? No problem - just tune the LED to match your new insulator's color. NOTE: These LEDs are quite expensive (approximately $20 apiece when fewer than 10 are ordered), but should last somewhere between 11 years and forever, depending on how many hours/day you keep them lit. They produce virtually no heat, and won't cause thermal damage to your precious insulators. 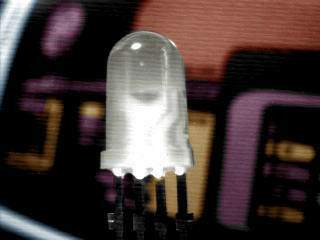 For lighting CLEAR insulators, use white LEDs, such as Nichia's NSPW515BS; $2.50 apiece at BG Micro. These have a color temperature of approximately 5,500 degrees Kelvin. Full color RGB LED lighting doesn't come cheap - I was lucky enough to come up with several pieces of this exotic lamp from one of my other informational websites - it's definately more for the wealthier insulator collector to persue..
White LEDs cost anywhere from $2 to $8 apiece, depending on what kind, where, and how many you buy. 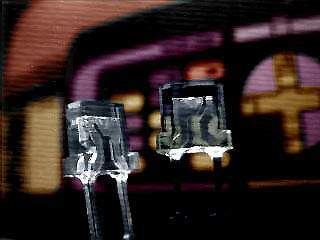 White LEDs can be used in colored insulators too, but the colors won't be as vibrant as a colored LED might produce. One or two white LEDs, or one full-color LED per insulator (they use about 1/10 of a watt apiece) should do the trick. So how big are these giant light bulbs in the pictures? The milky-colored one is smaller than the eraser on the end of a pencil, and the two clear ones are about a third of that size! 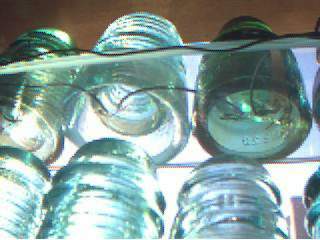 They should easily fit under any glass insulator, even under those small pony insulators. Color and white LEDs, for brightest models, get them directly from Nichia America. Buy them at The LED Light. You can buy 75Kohm trim pots (1 to 3 per LED needed on the RGB LEDs) for 25 cents each or 100 for $15. These are about the size of the eraser on a pencil and should fit the perfboard-style circuit boards you buy at Radio Shack. Mount the LED on the same board if it's small enough to fit completely under your insulator. You can also mount the LEDs remotely (by itself) on a tiny "umbilical" and have the color controls concealed elsewhere. Or just do it the cheap & simple way - with white LEDs and color filters! The white LEDs will never change color, fade or blow out like those miniature Christmas bulbs, and probably last forever. None of these LEDs generate any heat of consequence, nor do they generate UV (ultraviolet) that could change insulator colors over time; unlike direct sunlight or fluorescent light. If you just want some WILD, VIVID colors, just buy red, yellow, blue, turquoise, and green LEDs from Nichia or All-Electronics. Although you won't get accurate color rendition, you will get a heck of a pretty light show at night.